The DUP has said there are "still issues to be discussed" with the British government as Prime Minister Theresa May continues efforts to win support for her Brexit deal. A DUP spokesman insisted that extra cash for Northern Ireland was not being discussed despite the involvement of Chancellor Philip Hammond in talks on Friday. A spokesman said: "We are in discussions with the Government to ensure Northern Ireland is not separated out from the rest of the United Kingdom as we leave the European Union. Contrary to some reports, we are not discussing cash. "There are still issues to be addressed in our discussions." It comes as Mrs May continues her efforts to salvage her Brexit deal amid further signs of pressure on her position. Further talks are expected over the coming days with the DUP in the hope that persuading the ten Northern Irish MPs to back the deal will help sway scores of Tory Eurosceptics to fall into line. DUP deputy leader Nigel Dodds yesterday said lengthy talks with senior ministers including Chancellor Philip Hammond were "constructive" and there was a "renewed focus" from the government on addressing their concerns. Mr Dodds said: "We have had a constructive dialogue. Those discussions will continue over the coming period of time." Mrs May is expected to bring her Withdrawal Agreement back for a third vote early next week despite its overwhelming 149-vote defeat on Tuesday. Brussels has begun preparations for a possible delay to Brexit beyond the current 29 March deadline after MPs backed an extension to the Article 50 process. Documents circulating among EU ambassadors make clear the bloc would terminate the UK's membership on 1 July if it has not taken part in European Parliament elections. 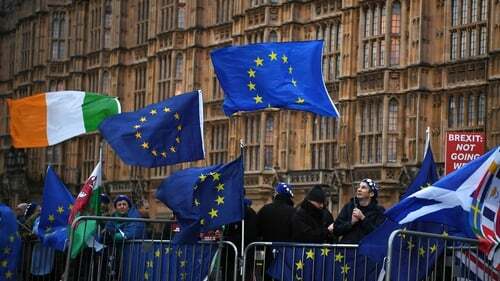 The draft paper obtained by the Financial Times makes clear Britain has to take part in the May 23-26 votes if it wants an extension of more than three months. The EU guidance echoes the briefing provided to MPs at Westminster before Thursday's vote, which said "if the UK were to seek an extension beyond 1 July, and hence remain a member state beyond that point, it would need to participate in the EP elections". "If we get the deal through as I hope we still will, we will now need a short, technical extension," he told the BBC. He added: "But, if not, we shouldn't be afraid to leave with no deal." Any Brexit delay will require the agreement of the other 27 European Union members, with talks about any conditions for an extension set to begin before leaders gather at a summit next week.